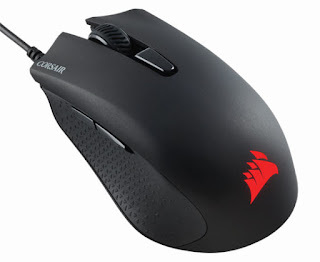 Corsair®, a world leading provider of gaming solution products, today announced the launch of HARPOON RGB Gaming Mouse. Ideal for FPS gaming, the mouse features 6000 DPI advanced optical gaming sensor. The advanced tracking and high-speed motion detection feature is pre-loaded for precise control and sharp moves. It is light weighted for enhanced gaming experience and is given a contoured design so as the mouse never slips out of user’s hand and allows gamers to get the most out of it. It has an out-of-the-box performance leading to a lag-free gameplay and superior responsiveness for a faster play. “The RGB feature enhances the way a gamer feels about the product owned. The higher level of satisfaction which a gamer gets on owning a personalized mouse is what we aim at Corsair. The light weight and out-of-the-box performance makes Harpoon RGB Mouse stand superiorly ahead of its fellow competitors giving that edge over stability and precise control,” said M A Mannan, Country Manager, India at Corsair. Designed to fit naturally in anyone’s hand the Harpoon RGB mouse supports multiple grip-styles too. The upper surface is a fine textured finish while the sides are textured molded rubber. This enables a slip-free gameplay for ultimate control and rubber sides enables to hold the mouse with a confident and firm grip. The compact and lightweight body helps in quicker reactions and reduced fatigue over a period of time. It does not allow the hand to slip while lifting the mouse or making quick swipes. HARPOON RGB boasts fully programmable lighting for its single RGB lighting zone, configurable in CORSAIR Utility Engine (CUE) software for stunning visual effects. Players can immerse themselves in the game with the HARPOON RGB’s vibrant LED lighting.